Bobrick B-29744 Semi-Recessed Automatic Universal Roll Paper Towel Dispenser. This unit complies with the EPA Resource Conversation Initiative. It also has four paper cost savings features including: adjustable towel length, second activation time, delay and shorter length on second activation and stub roll dispensing. The dispenser is powered by 4 “D” size alkaline batteries or an optional 6 volt DC power supply. It dispenses universal 1.5 to 2 inch diameter core rolls. 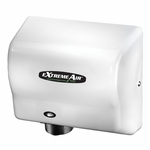 Concealed towels assure hygiene and are intuitively dispensed, with no motion required.